Typical. I started writing this article a couple of days ago, at 5.30am after yet another sticky, close night. In the end I gave up trying to sleep and decided to do something useful instead. It is now Sunday morning and the weather is cool and grey and rainy, making this one of the most poorly timed blog posts ever. But all is not lost. According to my phone, the heat is coming back. 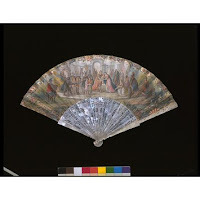 So, for those of you who love a heatwave - and those like me who just want it to be 20 degrees and cloudy LIKE NORMAL FOR JULY IN BRITAIN - here’s a quick overview of a few ways people have kept cool through history. At the end I’ll pick my favourite to go into this month’s Cabinet of Curiosities. 1. Caves. Ok, so they won’t fit into my cabinet, but many caves are Nice Cool Places. On holiday in Sicily this year, this was brought home to me in two different ways. The first was that my bedroom in our rented villa was one! It was by far the coolest (in both sense of the word) room in the house and despite the temperatures being well into in the 30s during the day, I slept well and long every night (and sometimes for afternoon naps too). We also visited the Cava d’Ispica, a series of caves which were inhabited from prehistoric times through to the middle ages. Obvious evidence of inhabitation ranged from soot markings, to stone-cut tombs, shelves and niches for lighting or possessions and the remnants of medieval frescos – a really stunning landscape detailing the different ways that people shape and use the natural world around them. 3. Fans. So this is where the photos get really pretty. 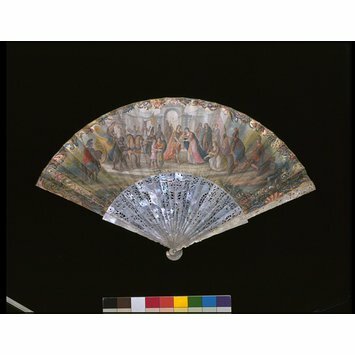 Used across different cultures for thousands of years (evidence dates from C4th BC in Greece and C2nd BC in China, for example), fans became a major fashion accessory in Europe in the eighteenth and nineteenth centuries. Disappointingly though, the so-called ‘language of the fans’ is, apparently, just a myth (or rather a later marketing ploy). While I’m normally one for historical accuracy in my fiction, please don’t let that put you off, romance writers! 4. Back to Sicily. I seem inexplicably not to have taken any photos of the frankly vast quantity of gelato I consumed on holiday earlier this year (I can’t imagine why that would be) so you’ll have to imagine it. Ice cream. Mmm. Again existing in some form (at least for royalty) for thousands of years, it seems to have developed in Europe into what we would recognise as ice-cream in around about the C16th and was gradually popularised as ice houses and then refrigeration became more available. Thank you, Charlotte. As the temperature rises again, just thinking about those cool caves and air conditioned walls, not to mention the ice cream, cools me down nicely. Very well-timed after all!